The cast of Fen. Photo by Nicole Thompson. BOTTOM LINE: A sad, funny, and unromantic look at life in a working-class English community, with characters you’d be hard pressed to forget. The plays of Caryl Churchill are not easy, but Fen might be one of the toughest. Luckily, it is also powerful and moving. Like Churchill’s other, somewhat more familiar works, such as Cloud Nine and Top Girls, Fen is concerned with economic exploitation and how it impacts love, marriage and family. A strong, mostly female ensemble, playing multiple roles, plunges headfirst into Churchill’s bleak vision in a new production mounted by Red Garnet Theater Company. First performed in 1983, Fen is set in a rural English village, where people’s lives are dreary and not getting any better. Those at the bottom of the ladder work on farms owned by their neighbors; the farmers are being pressured to sell their land to large multinational companies. The chief source of happiness in this community is family life, though even that doesn’t always keep despair at bay. Val (Aimee Rose Ranger), a young wife and mother, has fallen in love with Frank (Rudi Utter). She wants to run away with him and her children, but with no job prospects in the outside world, the lovers are forced to stay where they are, with Val moving into Frank’s house and leaving her daughters with their dad. This in-between life proves torturous to Val, and her relationship with Frank is fraught with tension. Life is no easier for Val’s friends or family. Her co-worker, Angela (Lauren Lubow), cruelly and sadistically abuses her stepdaughter Becky (Katie Consamus) as a way of relieving her own deep frustrations. Other unhappy characters include a bereaved mother who has turned to alcohol and religion to cope with her pain, Val and Frank’s bitter employer, and even the ghost of a woman who starved to death in the village long ago. In a series of loosely connected scenes, these figures and many more go through the rituals of daily life—shopping, ironing, working, blowing off steam at the pub—without quite being able to understand what it’s all ultimately for. Director Patricia Lynn has given the production a robust physicality that suits its setting, and the actors create the sense of a specific world with very little in the way of sets or props. The performances, while gripping and committed, seem a little unfinished. The episodic nature of the play is disorienting, by design, and it falls to the cast to provide a sense of a journey. It’s not quite there, though perhaps as the run continues, it could emerge. A solid, thoughtful execution of a Churchill play is always worth seeing. Red Garnet’s production of Fen is a worthy example of why this very English playwright is essential even on this side of the Atlantic. Putting women, children, and the underclass center stage, she’s like that village ghost: angry, haunting and impossible to ignore. Fen is by Caryl Churchill. Directed by Patricia Lynn. Assistant Director/Stage Manager is Michael Witkes. Lighting Design is by Sarah Stolnack. Sound Design is by Marc Jablonsky. Costume Design is by Patricia Lynn. Associate Producer is Annie Branson. Dialect Coach is Lizzie King-Hall. Fight Choreography is by Rudi Utter. 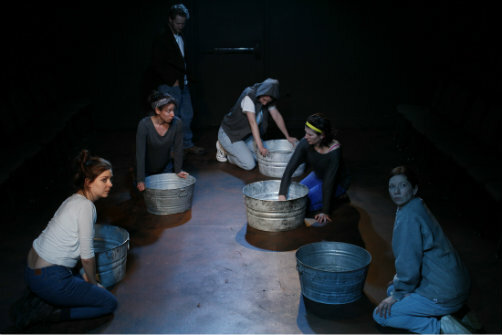 The cast is Annie Harper Branson, Katie Consamus, Lauren Lubow, Aimee Rose Ranger, Rudi Utter, and Lizzie Vieh.